In the early nineteenth century, sodium carbonate, used in the production of saltpeter, was frequently extracted from seaweed. The process required drying and burning the seaweed, producing ash that was then washed with water. When this liquid was allowed to evaporate slowly, several useful compounds would precipitate out in sequence. The liquid that remained after the desired precipitates were collect was generally treated with sulfuric acid before disposal. In 1811, a Frenchman named Bernard Courtois accidentally added an excess of sulfuric acid in this final step, and was astonished when this produced a cloud of purple vapor which condensed to form a shiny crystalline substance on cold surfaces. Though he was employed in the production of saltpeter due to his financial circumstances, Courtois had had enough formal chemistry training to realize that his discovery was significant and suspected that he had produced a new element. Lacking the time or resources to study the material further, he passed the material on to two chemist friends, who continued his investigations and published their findings in 1813. More famous chemists quickly confirmed the nature of the substance as a new element, and one, Joseph Gay Lussac, suggested the name be derived from iodes, Greek for violet, due to the color of iodine’s vapor. In some ways, iodine mirrors the properties of the lighter members of the halogen family: fluorine, chlorine, and bromine. Like the other halogens, iodine in elemental form exists as a diatomic molecule, and its compound with hydrogen, hydriodic acid, is a strong acid that is a useful chemical reagent, particularly notable for its role in the industrial production of acetic acid. Hydroiodic acid is additionally used to produce other useful iodine compounds, particularly alkyl halides, which are important in organic synthesis. Silver iodides, like the other silver halides, are light-sensitive, a property exploited in film photography. Both bromine and iodine can be used in metal halide and halogen lamps, though designs using iodine are more common. Unlike the other halogens, the heavier iodine is solid at room temperature, and, being less electronegative, is less reactive. This lower reactivity plays a role in making it less toxic in elemental form than the lighter halides--while fluorine, chlorine, and bromine cause burns upon contact with tissue, elemental iodine is considered an irritant, and requires prolonged contact with skin to cause significant damage. This allows the use of iodine solutions as topical disinfectants, often used to clean skin prior to surgery. Elemental iodine is not particularly soluble in water, so these solutions typically include solubilizing agents in addition to iodine. An additional unique use of iodine is in various analytical chemistry procedures, particularly the detection of glucose polymers such as starch. Iodine-impregnated polymer films are used as extremely cost-effective light polarizing optical filters found in products such as LCD screens, sunglasses, and optical microscopes. The other unique applications of iodine relate to its role as an essential nutrient. Iodine is a necessary component of the thyroid hormones T3 and T4, which regulate metabolic rate. Iodine deficiency causes enlargement of the thyroid gland, a condition known as goiter, as well as the myriad symptoms of hypothyroidism. Many populations lack access to sufficient dietary iodine, and many nations now mandate that table salt be treated with iodine salts in order to prevent endemic goiter. This is generally considered one of the simplest and most effective public health measures, as iodine deficiency is a leading cause of intellectual and developmental disabilities. Iodine salts are common in nature, but relatively few sources of iodine are useful commercially. The most common source is brines that collect in used oil and gas wells, which may be purified and treated to produce iodides. The iodides are then reacted with chlorine to produce the pure element. The only other commercial source of iodine is caliche mineral formations in Chile; these are primarily mined for the extraction of sodium nitrate, but iodates and iodides are recovered as byproducts. Iodine forms compounds with many elements, but is less reactive than the other halogens. Iodine is only slightly soluble in water. It dissolves readily in chloroform, carbon tetrachloride, or carbon disulfide to form purple solutions. Iodine compounds are important in organic chemistry and very useful in medicine. Potassium iodide is used in photography. Iodine is a Block P, Group 17, Period 5 element. 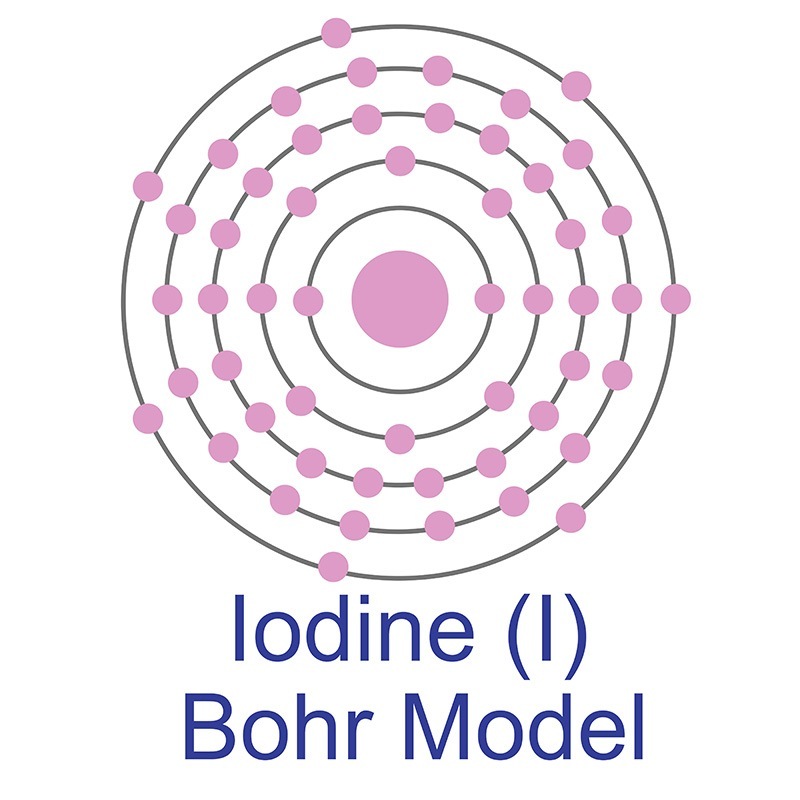 The number of electrons in each of Iodine's shells is 2, 8, 18, 18, 7 and its electron configuration is [Kr] 4d10 5s2 5p5. The iodine atom has a radius of 140.pm and it's Van der Waals radius is 198.pm. In its elemental form, CAS 7553-56-2, iodine has a lustrous metallic gray appearance as a solid. As a gas it has a violet appearance. Iodine is found mainly as the water-soluble iodide I3-. Iodine was discovered and first isolated by Bernard Courtois in 1811. Iodine in large amounts is poisonous but in small doses is only slightly toxic. Safety data for Iodine and its compounds can vary widely depending on the form. For potential hazard information, toxicity, and road, sea and air transportation limitations, such as DOT Hazard Class, DOT Number, EU Number, NFPA Health rating and RTECS Class, please see the specific material or compound referenced in the Products tab. The below information applies to elemental (metallic) Iodine. H312+H332 Harmful in contact with skin or if inhaled. P312 Call a POISON CENTER/doctor/…/if you feel unwell. Skin irritation or corrosion: Corrosive effect on skin and mucous membranes. Eye irritation or corrosion: Strong corrosive effect. Iodine has one stable isotope: 127I.